Lanrewaju Akinsola is an influential commentator, especially on social media. He is passionate about history and owner of the famous historical Onigegewura Blog. His blog is a required reading for anybody in search of knowledge. 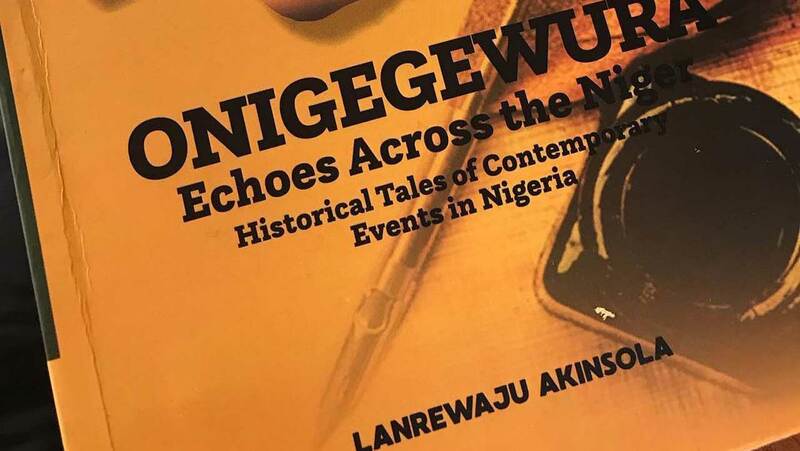 Akinsola’s acute eye for detail and firm grip of his narrative skill is brought to bear in his recently released book, Echoes Across the Niger: Historical Tales of Contemporary Events in Nigeria, which was released earlier in the year. The lawyer may not have academic degree in history, but his accounts are revealing and almost a Bible to ‘students of history’. This, in fact, makes his book astonishingly rich and detailed. Suffice it to say that in the book, history takes wing and flies, leaving his narratives to become animated. A fitting follow up to his blog of so many years, the book does a fine job of tracing historical moments and how they inspire the new Nigerian narrative. It illuminates and provokes critical explanation of the poor perception of history in the country, which, perhaps, accounts for why at a time government took it out of the school curriculum before it was brought back.Published by ASCO Publishers, the 562-page book is pacy, breathtaking and compact. Little wonder it reads like a novel. In the foreword, Justice Olubunmi Oyewole of the Court of Appeal, Enugu Division, has this to say: “The delivery style is racy, pacy, ecstatic and educative at the same time. The research is deep, reflective of painstaking attention to details. Coming at a time when the nation is seeking for direction with competing forces in the perpetual struggle for its soul, this series cannot be more timely.”In Echoes Across the Niger, the author relives topical issues and events in the country’s contemporary history in beautiful prose as if they happened right in his presence to educate the reader. The tales are familiar for those who are used to Onigegewura blog. However, the lawyer, whose affinity for history and biography artfully weaves together in a narrative, issues that are both detailed and arresting. They equally echo across the age and from state to state in a sweeping new history. The story of Ejigbadero, the king of land grabbers in Lagos of the 1970s and how he got his comeuppance; how the Emir of Kano and former governor of the Central Bank of Nigeria, Emir Muhammadu Sanusi II sanitised Nigerian banks in 2009 and the story of the late first civilian governor of Bayelsa State, Diepreye Alamieyeseigha are all in the book. Also unveiled is the intrigue involved in the late Basorun M.K.O Abiola becoming the Aare Ona Kakanfo of Yorubaland, in 1988. There’s also the shameful tale of the cement armada of 1975/76; the Wetie crisis in the old Ondo State, as well as how the late Chief Gani Fawehinmi, almost lost his wig and gown. The rich book doesn’t neglect milestones including the Aba Women’s riot, the martyred miners of Enugu and how it took some three years and civil disobedience from Oyo people for the Alaafin of Oyo, Oba Lamidi Adeyemi, to ascend the throne of his ancestors.Indeed, Echoes Across the Niger is a fat book with lots of enriching and enjoyable stories. It’s not just controversies, personalities and events that occupy the Onigegewura. There are also beautiful stories on the late Apala musician, Ligali Mukaiba, better known as Baba Lepe; Haruna Isola; the maverick Ayinla Omowura and his unfortunate end and how the relationship between the late Chief Bolarinwa Abioro of TYC Records and King of World Beats, Sunny Ade soured. Akinsola, who sees himself as an amateur historian, said: “It is to preserve these historical tales that I embark on the task of publishing this book. It is, therefore, my modest attempt at preserving some contemporary events in our recent history for future generations.”“It is my belief that understanding what happened in the past is crucial to making informed decisions about the present and the future. This is more so that history has a way of repeating itself over again. I also consider it important for us to learn about the achievements of our fathers, and of course to learn from their errors,” he quipped. “In the last few years, especially with advances in technology, social media has become an indispensable part of our everyday life. Virtual environment has become the centre of our very existence. Most of us rely on the Internet for information, news, education, transactions, and in fact almost everything,” he remarked.